P is for Persist! – B is for Blessed! Persistence is necessary if we are going to receive the best God has for us. Each of us must persist if we are to finish our race. There will be trials and obstacles to deter us from finishing. There will also be distractions to steer us off course and away from our goals. In order to overcome these pitfalls persistence is a necessary virtue, one that separates those who could from those who would. Persistence denotes the virtue of endurance. It is essential that we stay rooted in the Word of God consistently and not just when we are inclined to. We must stay faithful, hope filled and fearless. We must stay faithful, hope filled and fearless. It is often not as hard to stay in a position as it is to get there. If we are going to get to that place where we can receive God’s best and stay there, it will require persistence on our parts. We must condition ourselves to endure our tests full of expectation, determined to do our best independent of others no matter what! Often we know what we should do to grow, mature and improve ourselves, yet fail to do it consistently more than a couple of months, weeks or even days. Instead, strive to be persistent like worker bees, refuse to lose your “buzz” for God and His best this life has to offer. Persist and refuse to give up on your goals and God’s purpose for you no matter your current circumstances. Persist in pursuing what God has placed in your heart to the point that people just think you are crazy! Persist! Remain and endure in the Lord. Refuse to give up. Persist in your race no matter what! Heavenly Father, I pray that I am persistent in the pursuit of your best life for my life. I pray for the strength and fortitude to keep going when I don’t feel like it and other people think I am losing my mind. I pray to persist in doing what is right and walking away from those things that would remove me from Your presence. Thank you for these things I ask in Jesus’ name, amen! Wooo! 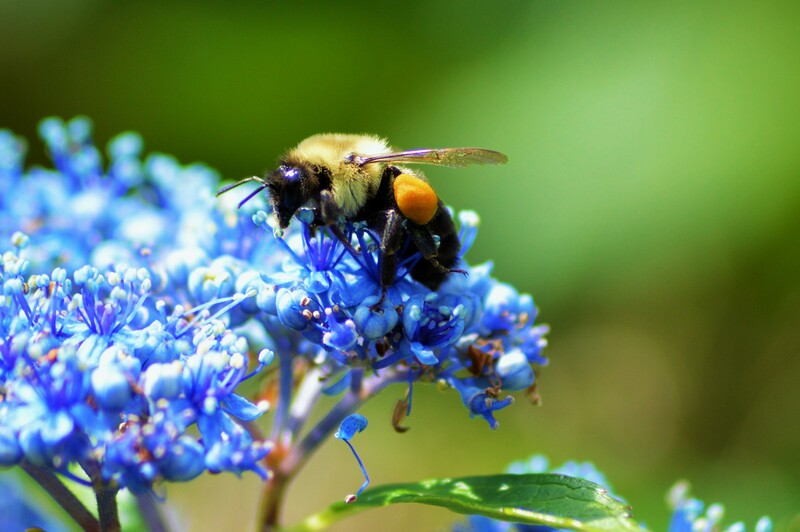 The photo of the bee on top of the blue flowers is so refresing! Love it! Great post, Lilka! A belated Happy Thanksgiving to you!